Ann Louise Bardach is a writer at large for Newsweek. She is working on a biography of Vivekananda. The party planning is in full swing throughout India. Never mind that the big day, Jan. 12, 2013, commemorating the 150th anniversary of the birth of Vivekananda, is more than 15 months away. Not too long ago, Vivekananda, a household name in his homeland, was famous here as well, as the first missionary from the East to the West. If you’re annoyed that your local gas station is now a yoga studio, you might blame Vivekananda for having introduced “yoga” into the national conversation — though an exercise cult with expensive accessories was hardly what he had in mind. The Indian monk, born Narendranath Datta to an aristocratic Calcutta family, alighted in Chicago in 1893 in ochre robes and turban, with little money after a daunting two-month trek from Bombay. Notwithstanding the fact that he had spent the previous night sleeping in a boxcar, the young mystic made an electrifying appearance at the opening of the august Parliament of Religions that Sept. 11. For most of the rest of the month, Vivekananda held the conference’s 4,000 attendees spellbound in a series of showstopping improvised talks. 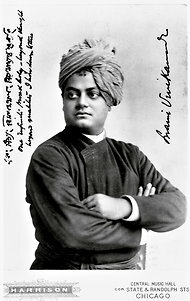 He had simplified Vedanta thought to a few teachings that were accessible and irresistible to Westerners, foremost being that “all souls are potentially divine.” His prescription for life was simple, and perfectly American: “work and worship.” By the end of his last Chicago lecture on Sept. 27, Vivekananda was a star. And like the enterprising Americans he so admired, he went on the road to pitch his message — dazzling some of the great minds of his time. Yet precious few of the estimated 16 million supple, spandex-clad yoginis in the United States, who sustain an annual $6 billion industry, seem to have a clue that they owe their yoga mats to Vivekananda. Enriching this irony was Vivekananda’s utter lack of interest in physical exertions beyond marathon sitting meditations and pilgrimages to holy sites.